Source: NAACP Legal Defense & Educational Fund, "Death Row USA" Winter 2008. See Death Row. A recent audit of the construction costs for a new death row facility at California’s San Quentin prison revealed that estimates have soared over 80% from previous projections. Ground still has not been broken for the project, but the new death row is likely to require nearly $400 million, instead of the $220 million originally quoted, and it will provide even fewer cells than planned. As an average of 12 new condemned inmates arrive at San Quentin annually, the new facility will be full only three years after it opens. The lethal injection chamber at San Quentin has already been renovated at a cost of $750,000. The new construction is projected to cost over half a million dollars per cell (more than double the original estimate). “I think this report is a bombshell,” said Assemblyman Jared Huffman. “They simply want to build a massive monolith to house all our condemned inmates on the most expensive piece of real estate in Northern California.” Assemblyman Juan Arambula called the costs "alarming." A joint Assembly and Senate committee is still considering the prison agency’s funding request for an additional $136 million to start the construction. California has the largest death row in the country with approximately 670 inmates. (M. Rothfeld, “Costs Soar for New Death Row at San Quentin,” L.A. Times, June 11, 2008). See Costs. The Death Penalty Information Center has conducted a survey of death row populations as reported by the various state departments of correction in January/February 2008. From that survey, the current death row population across the country is 3,263. California continues to have the highest death row population with 669 inmates. Florida follows with 388, and Texas has 370 inmates. A state-by-state breakdown appears below. Except for Illinois and the federal government, these numbers are the official totals from each state's prison system. The death row number for Illinois comes from the Supreme Court Unit of the Public Defender's Office in Springfield, while the federal number comes from the Federal Death Penalty Resource Counsel and the Federal Defender Organization. BOOKS: "The Bitter Fruit of American Justice" and "I Shall Not Die"
Two new books address the death penalty from different perspectives: one analyzing the future of capital punishment, the other, by Billy Neal Moore, relates the experience of being on death row. Alan Clarke and Laurelyn Whitt examine two factors that are gaining importance in the debate over capital punishment. 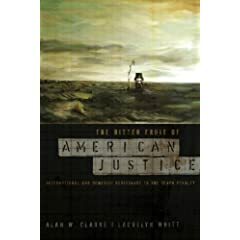 The Bitter Fruit of American Justice (Northeastern 2007) contends that increasing opposition to the death penalty throughout the world could affect how other countries relate politically to the United States. The second influence is the repeated discovery of innocent people on America’s death rows. The authors suggest that these two factors could lead to the end of the death penalty in the United States. Ronald Curtis Chambers, who was originally sentenced to death for the 1975 murder of Mike McMahan, may be given a fourth trial following a ruling by the U.S. Supreme Court. Chambers was 20 at the time of his crime, and has been on death row longer than any other inmate in Texas. His second trial came 10 years after his first, following a Texas court ruling that Chambers should have been told that information from a psychiatric consultation could be used against him. Chambers received a third trial after courts found that the jury selection in his original trial had been racially biased. He was sentenced to death at all three trials. Chambers was granted his most recent re-trial because the jury instructions during his 1992 trial did not allow the jurors to properly consider mitigating factors that might have made the death penalty inappropriate. These mitigating factors included his young age, his home life, and the poor economic conditions in west Dallas where he was raised. The standard jury instructions used at Chambers’ trial have since been changed, but some inmates who were sentenced by juries who were given these instructions remain on death row. (“Dallas man on death row gets fourth trial after review,” by Diane Jennings, The Dallas Morning News, January 2, 2008). See also Arbitrariness and Time on Death Row. NEW RESOURCE: "Death Row USA" Winter 2007 Report Now Available The latest edition of the NAACP Legal Defense Fund's "Death Row, USA" reports that the number of people on death row in the United States rose slightly to 3,350 as of January 1, 2007, an increase of 6 inmates from October 1, 2006, but a decline of 23 inmates from a year ago. The slight increase appears to be partly the result of the relatively few executions in the last quarter of 2006. California (660), Florida (397), and Texas (393) continued to have the largest death row populations.